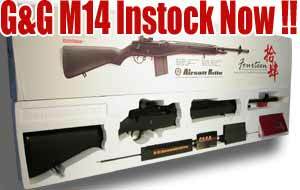 You are here: REDWOLF > Home > News >News Detail - G&G M14 now in stock! G&G M14 has finally arrived to our store after much anticipation. Proving to be very much worth the wait, the G&G M14 clearly was thoroughly tested and refined before this export version was finalized. Having learned that quality control is very important for a new gun based on their initial experience with Version 1 of the GR16 last year, this M14 proves that G&G is determined to produce only but the highest quality products. Shoots in both semi and full-auto modes, this M14 looks very handsome and comes with a 470 round hi-capacity magazine. Adjustable hop-up and large battery compartment in fixed stock. Shoots a whopping 320fps - 340fps out of the box at 900 - 1000 rounds per second for a shower of terror! Buy one now!